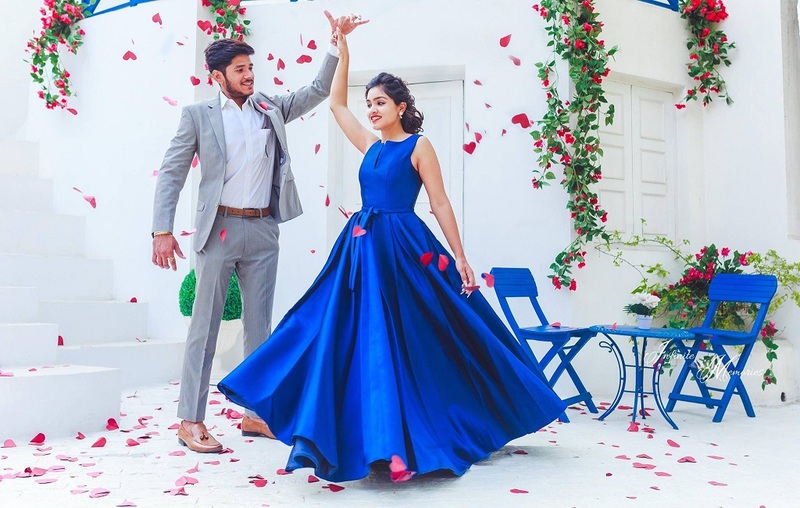 Pre-Wedding Shoot Location Ideas That Will Mesmerise You - Wedding Affair var admin_url = "https://weddingaffair.co.in/wp-admin/"
Destination pre-wedding shoots have been in-trend for a while now with couples heading Thailand, Dubai and Maldives and other countries for their shoots. Just rewind your memory a bit and you may recollect flashes of a video that went viral, which had a bride-to-be dancing on Cheap Thrills by Sia at a resort on an island. Yes, that’s what we are talking about. Apart from this, cruise shoots too are in vogue. 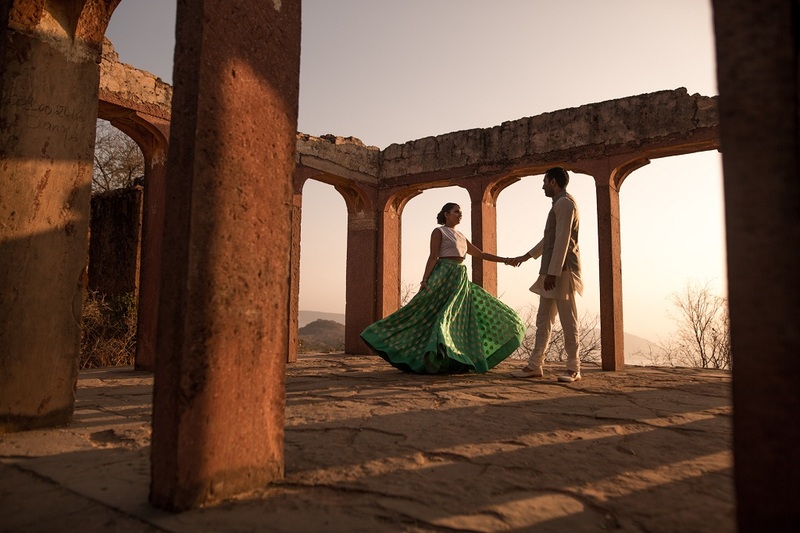 From a village set up to a vintage car, to Santorini, studios are coming up with creative backdrop ideas to provide versatility to the shooting couples. Foreign locale sets, college- library setting, coffee shop, red telephone box, bonfire, castles and much more; Studios have almost all your desired elements under their umbrella. Mountains, rivers, deserts, beaches do not require much cosmetic interference except for little light-adjustments. 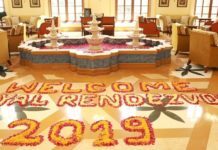 The picturesque hot tourist spots like Ladakh, Dal Lake, Thar Desert, and others lend visual appeal to any shoot and are gaining popularity increasingly among couple who wish to declare their union to the universe. 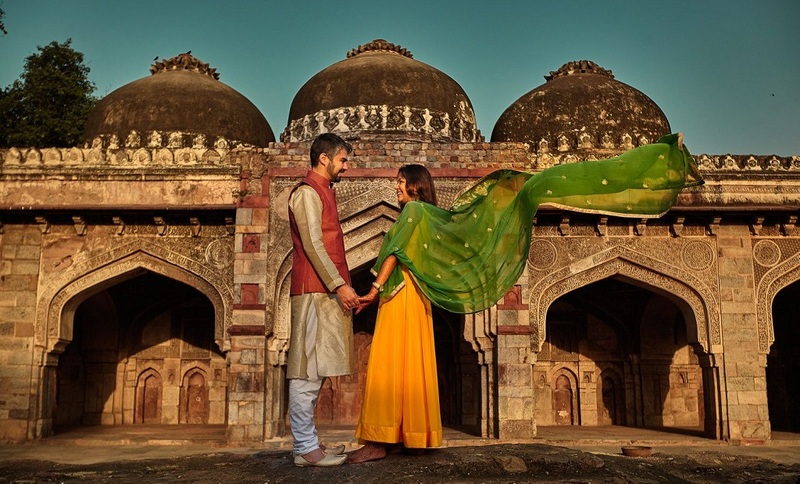 Some couples opt to shoot around places of historic or mythological importance. Humayun Tomb, Qutab Minar, Mahabalipuram, flower-fields, Taj Mahal, Hawa Mahal, Amer Fort to feel no less than a royal couple. The magnificent architecture of these sites gives a touch of regality to the footage. With soul mates longing for a little more ‘we-time’ a few days ahead of their rituals and nuptials, who wouldn’t want to take this fun-trip together. Sneak A Peek Inside The Ambani-Mehta Pre-Engagement Party!